So it appears to you updated to the 2012 facelift style based on the headlight shape. I know there are 2011s that have the same hood and headlights as mine but come with the DRLs I stead of fogs as well as the arrow mirror covers. I am wondering if a bumper from this year/model would be a clean swap. I can't imagine why there would be a gap where the headlights are but I could be wrong. Part numbers would really help. Attachment 300467The fender lights are from the wires that I re-used from the bumper amber corner lights. Attachment 300468If you look closely you will see the OEM fog lights I re-used behind the lower grill of the new bumper. 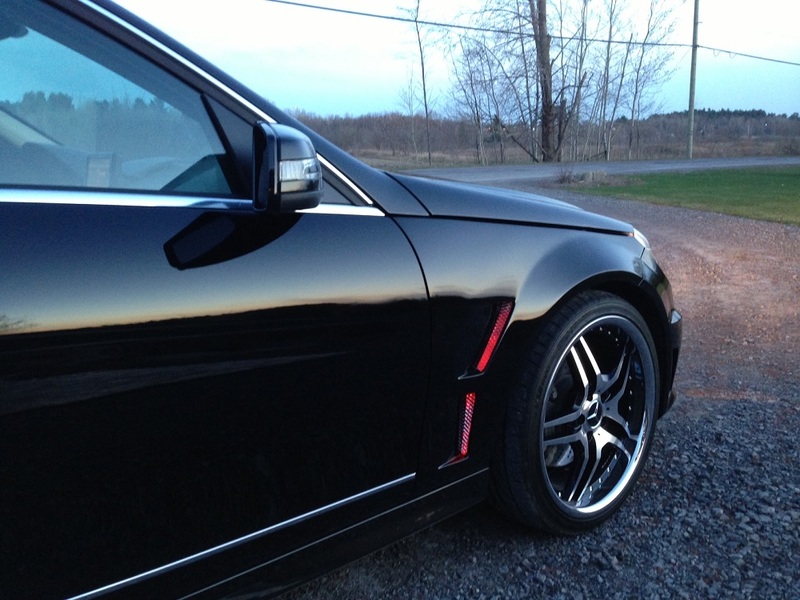 I am thinking on installing DRL to conserve the xenons during the day. I would also like to keep my fog lights. I found this: http://www.aliexpress.com/item/CARSE...276904360.html . 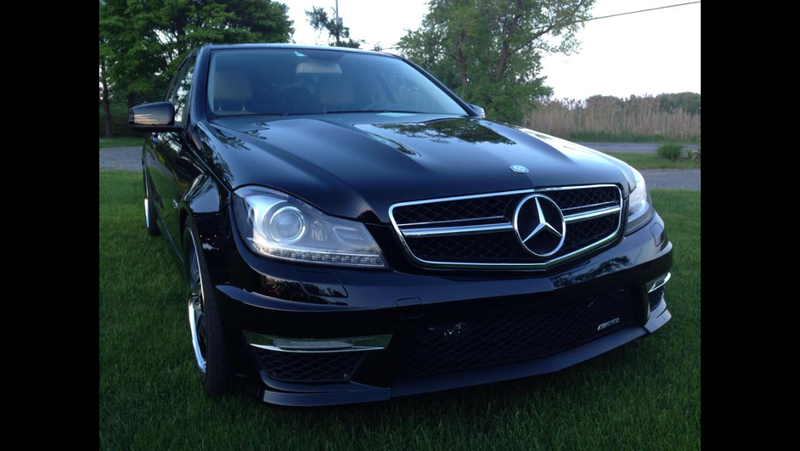 The seller says it has controllers for dimming the leds while the headlamps are on. 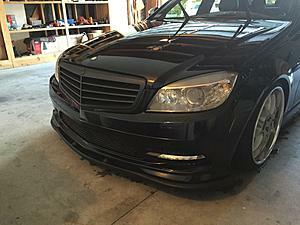 Anyone fitted something like this on the car? I wonder if it would work without having to cut the fog lamps' grille. Last edited by reneftw; 03-01-2015 at 11:36 AM. Did mine over the weekend. I thought about going to a shop and have em install it for me but nah. It was a pretty easy mod tbh. Last edited by FAneek; 01-11-2016 at 07:31 PM. I got mine on Ebay. Are you in Socal? In the far reaches of NorCal. These are supposed to be plug and play except for needing to trim the bumper. Are they really plug and play? Do they stay on all the time with the car running without modifying the wiring. I'd like to have feedback from someone who has these. Seems like a good price and I've purchased from this seller and they have good CS. Got it from the same seller. The warehouse is located in Rancho Cucamonga. Yes just plug and play. They do stay on all the time. Last edited by FAneek; 01-11-2016 at 10:54 PM. I found these, a set of DLR that keeps the fogs. Cheaper too. Has anyone installed these? 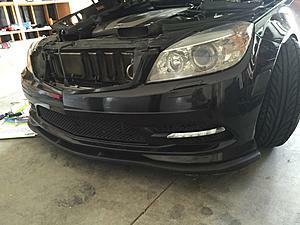 So from what I am reading, trimming the bumper is a required necessity for this mod? Correct. Just use a dremmel....should take about 10-15 each side. I want to do the same mod to my car. However, I found out that the resistors can get really hot and may melt the bumper or any other plastics around them. Where did you place the resistors to avoid the problem? Do the capacitors have the same issues with temperature? 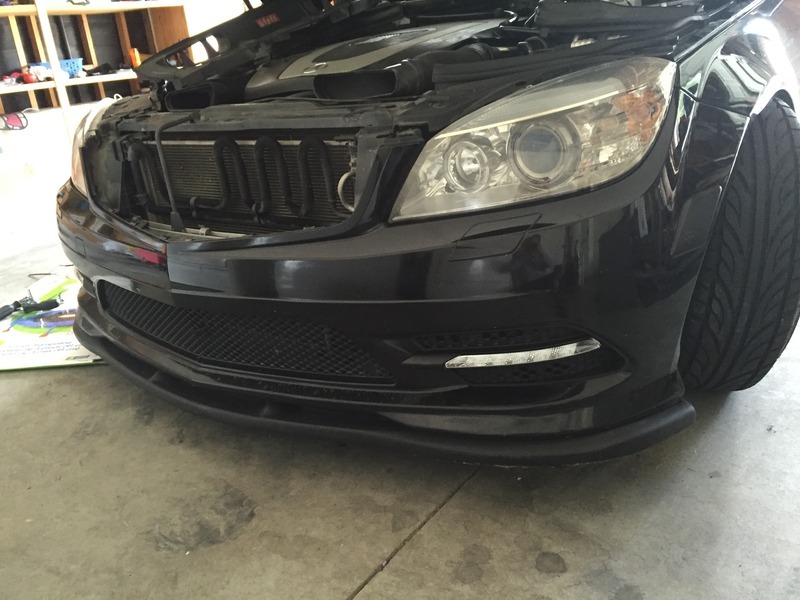 I will connect the DRLs to my fog lights to have full control on them. I have a 2009 C350 with the 2011 LED's. I didn't want to use resistors for the same reason. Heat is bad. I wired mine through a relay so they are on as soon as you start the car. If that is what you are looking to do, I can figure out a diagram and post it. 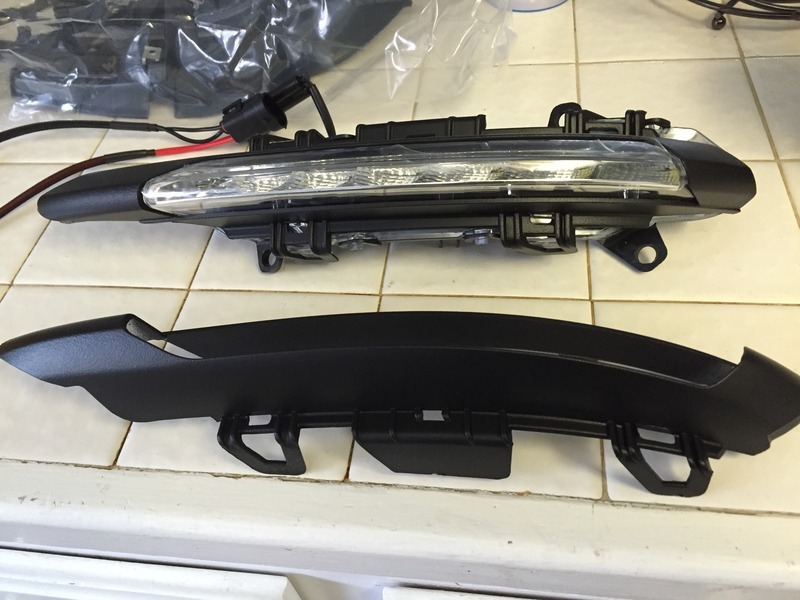 Do your LED DRLs light up when you unlock your car? I really like this feature in the surrounding lighting and that is why I was thinking of connecting them to the fog lights directly. However, if this is going to cause issues due to the high temps, then I prefer to follow your advice. A diagram would be very much appreciated as well as the type of relay you used. They only light up when you turn the ignition to on. What year is your car? Do you get any warning message for the fog lights? No warning light, but that's because I don't turn them on. No need since they are on all the time with the ignition. I'm guessing it would tell me there is an error if I did. Here is how I wired my LED's. I used an inline fuse holder close to the battery post connection, then grabbed switched power at the fuse box on the driver side under the hood. I tapped the main power wire in. I then grounded the LED's and ran a ground to the relay which I mounted by the fuse box and ran the hot side of the led's to it. Hope that helps. Please double check before doing this wiring yourself, I offer this as an example and recommend you check with a 12 volt specialist before doing any wiring on your car. Last edited by CGC; 07-06-2016 at 02:49 PM. I remember back when the 2011s first came out I told myself the round fog lights looked cooler and were more functional... now they just look really outdated - even more so than in 2011, while the 2011 LEDs now look slick and really update the front end, so I think now is the time to make the switch. Sort of unfortunate that the bumper has to be permanently cut and the original fogs cannot be put in, but seems worth it. It also bothers me that hooking the LEDs up to the fogs makes them used in a way they were not meant to be used, on the real 2011s, when you unlock the car at night, the headlights come on and the LEDs are in dim mode -- these LEDs are NOT fog lights, however us 2008-2010 owners are installing them like they are. This is why I installed foglights inside the grill. So my LED's are on all the time as soon as I start the car. The fogs I wired to the factory harness so they come on with the factory knob and stay lit when you turn the car off for half a minute or so. Best of both worlds, but the fogs don't have the best beam since they are behind the grill. Last edited by CGC; 06-01-2017 at 10:32 AM. 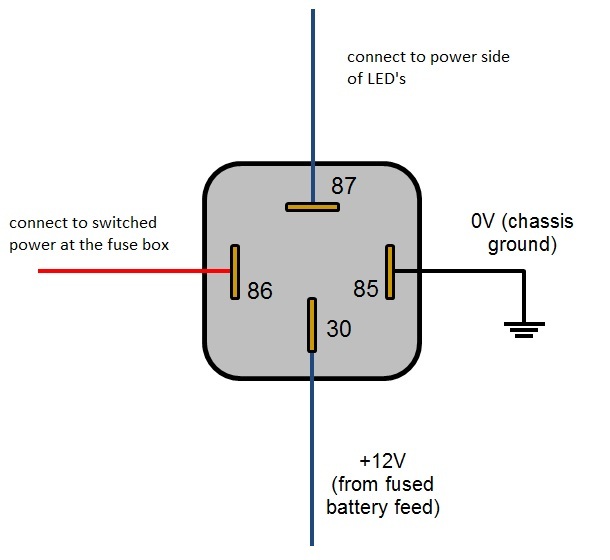 This relay will half the power to the LEDs when a wire receives voltage. I have the lighting package and the awful corner fog lamps... so i will be putting dummy resistors in my fogs to get rid of the error codes and seal the fog connectors up. Then, the constant 12v supply to this LED controller will instead be wired to one of my side markers - that way when the car is unlock and the headlights are NOT turned on, the DRLs will go on full mode to light up the parking lot at light... then the relay switch must be attached to a 12v power supply that turns on only when the Xenons are on... have to find this, and when I do, I should be set. DRLs ONLY on with parking lamps, that way I can control them. 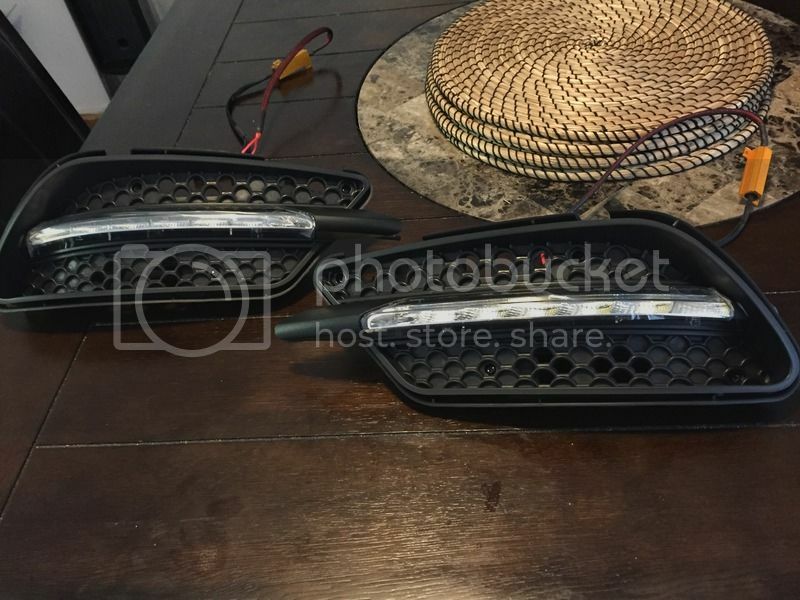 I would like to convert my fog light into LED DRL. I found this part on ebay http://www.ebay.com/itm/111660845239, will this work by itself without additional parts? And do i need to cut my bumper to fit this light?